In January 1868, Thomas Herron, also known as Viscount Ranelagh, was brought before Clerkenwell Magistrates Court. This noble Lord was being prosecuted for an action he thought hardly criminal; smoking on the Metropolitan Railway. The Metropolitan Railway had opened in 1863 and was (along with its younger sister the District) the only railway in the country where smoking on board trains was prohibited (it had been exempted under the 1868 Regulation of Railways Act which obliged railways to offer smoking accommodation). The special conditions surrounding the Metropolitan, it being a short distance, high capacity underground railway, were argued by the Directors of the company to make it impractical to offer smoking compartments on trains. Ranelagh put forward a guilty plea, but as he was being fined, decided to claim that he wasn’t a law-breaker after all, but rather pleaded guilty to save his time and wanted to offer some observations. Faced with this clear claim of innocence the Magistrate obliged him to remove his guilty plea and call evidence. The evidence did not help Ranelagh’s case. On the 20th December 1867 Ranelagh had been travelling on the 10.55pm train. According to the train’s guard, Ranelagh was smoking at Aldersgate Station (now Barbican) and he asked him to stop. At the next station, Farringdon, the guard once again found Ranelagh smoking. The guard again asked him to desist at which point Ranelagh ‘said there was no one there to annoy, and he would smoke and be damned to me’. Ranelagh argued that when the no smoking regulations had been conceived smoking had been the exception, but now it was the rule. Most other railways offered smoking accommodation and as such the Metropolitan should permit smoking. The Magistrate decided that this wasn’t a particularly valid point of law and fined the erstwhile Lord 20 shillings. Ranelagh paid immediately. This seems like a random incident, but the debate over smoking on the underground grew surprisingly large. In 1869 the MP for Dudley moved in the House of Commons that the Metropolitan be forced to provide smoking accommodation for each class of passenger, the House dividing in favour 175 to 167. However, the legislation was not immediately successful, and the company only offered smoking accommodation in 1874. He added that smoking was practiced by gentlemen as well as ‘roughs’ and the staff did little to prevent it. ‘I have even seen a clergyman quietly smoking, and when I remonstrated with him he only laughed and said the guards all knew him’. But the smoking lobby was a vociferous one. 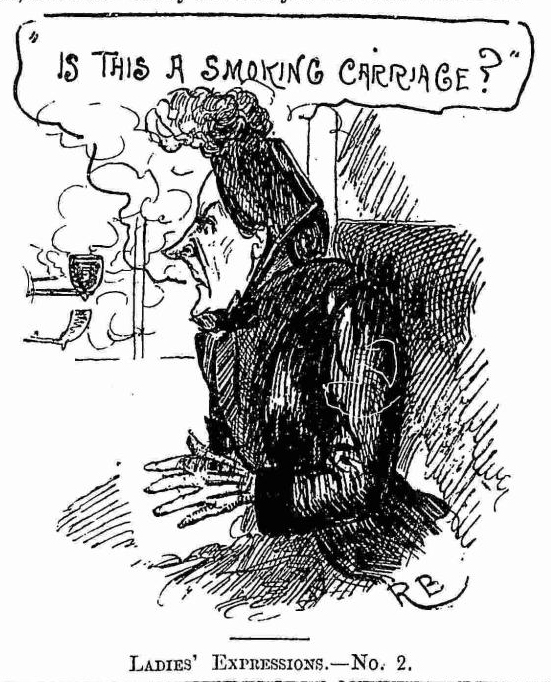 Writing in reply to ‘John Bull’, ‘M.J.B.’ contended that smoking compartments should be provided given that smoking was something to be grateful for ‘just after breakfast’ and ‘again in the evening after an abstinence of many hours’. He also added that the majority of passengers were actually smokers. Of course, in reality, both smoking and the atmosphere of the steam run underground was liable to ruin your health, despite the claims of certain parties that it was like being in a spa. The other problem was that the other railway companies who shared parts of the Metropolitan offered smoking accommodation. Trains from the Great Northern, Midland, and Great Western railways used stretches of the Metropolitan between Paddington and Moorgate. In 1871 Mr Arthur Bennet found himself in front of the Magistrates charged with smoking on the Metropolitan. However, Bennet had been riding in a Great Western train in the smoking compartment. When the train started at Ealing, smoking was allowed, but when it reached Paddington (and the Metropolitan), smoking was now prohibited. The gentlemen, despite his protestations that he was a Great Western customer and had nothing to do with the Metropolitan or their regulations, found himself fined ten shillings. But the move bought consternation from non-smokers and especially those who complained about the impact for female passengers, who were also considered non-smokers (read more about this in ‘Ladies first’). Such complaints were soon brushed aside. Indeed, the history of smoking on London’s underground was one of ever increasing provision up to the Second World War. On the Tube, where smoking had always been allowed on trains, by 1926 around sixty per cent of carriages were smokers. In that year, however, it was decided this was still not enough. Eighty per cent of carriages were thus given over to smokers, with non-smokers exiled to the first and last carriages of the trains. Rules which had banned smoking in the station lifts were also abolished, giving smokers leave to puff on cigarettes, cigars, and pipes anywhere they pleased. Concerns that this amounted to over-provision, and arguments that smokers were a minority in smoking carriages and hence aggrieved the other passengers were casually brushed aside. Smokers were the kings of the Underground. But all things must come to an end. As we shall see in next month’s post, the smokers found themselves on the defensive after the Second World War. A story of marginalisation and tragedy followed, and in direct contrast to Ranelagh’s claim in 1868 that smoking was the rule, not the exception, the post-war story was exactly the opposite. Taking a walk on the wild side. The topic of the debate was rather unusual. In a move which would be considered by the modern Londoner to be an extreme measure of Government interference, the ‘Nanny state’ writ large, the Lords were debating whether to force pedestrians to walk on the left hand side of the pavement. In fact, in July 1922 around 40 authorities in Greater London began to display prominent signs requiring people to walk on the left hand side. But the mismatch of rules created broader issues. The London County Council, as a result of the City’s rejection, refused to display signs advocating the walk on the left rule, despite the fact the LCC itself agreed with the principle. The Metropolitan Police, similarly, decided it was best to adopt a policy of neutrality. Indeed, the primary means of forcing people to walk on the left appeared to be the Earl of Meath, who cornered unfortunate members of the public walking on the right and severely told them off. Indeed, the right of the Englishman to walk on the right hand side was described in a letter to The Times in 1935 as ‘the habit of the nation’. Later in the debate Earl De La Warr rather dryly suggested that it was a possibility ‘that the taxi-cab increased its speed when the driver saw the noble Lord’. It transpired that the Metropolitan Police, whilst able to prosecute speeding drivers, were in actuality both effectively unable and reluctant to do so. To obtain a conviction the Police had to provide evidence that the driver was speeding, but the only way to do this was to use a stop watch to calculate the speed of the offending car over a set distance. This was clearly impractical, so speeding cars were unlikely to be stopped. In any case, aside from the walk on the left campaign, other novel ideas were being developed to protect London’s pedestrian masses. In 1935, in a first which has become a standard across the UK, the first pedestrian activated traffic light was introduced in Trafalgar Square. Other ideas, however, were less successful. In 1936 the Police fixed a loudspeaker on top of a car and proceeded to shout instructions to people trying to cross the road. Though perhaps this was simply ahead of its time. It wasn’t a complete failure, however. The current Highway Code requests that pedestrians on the pavement should avoid walking on the kerbside with their back to traffic, effectively a suggestion to walk on the left. Despite this, it would seem the nation’s pedestrians remain of the inclination, so often remarked upon in the 1920s and 30s, to walk however they please. Perhaps the Government should send out the Earl of Meath out to shout at people again. Who could say no to a face like that? So wrote a passenger travelling from Edinburgh to Glasgow in 1869. His target, the so-called ‘itinerant musician’, or, to the reader of the 21st Century, the busker. Busking is a fairly familiar sight to passengers on the modern railway, especially on the London Underground. In 2003 Transport for London altered its byelaws and made it legal for buskers to perform on special pitches, leading to a rapid infestation of Irish bands on the Circle line and this guy on his guitar. Certainly some are better than others, but to the railway companies of the 19th century buskers were a recurring nuisance. The LNWR thought them worthy of the same disdain as beggars, vagrants, and prostitutes. The LNWR, where no fun of any kind was apparently allowed. Our Scottish passenger, writing under the pseudonym of An Observer, outlined his predicament to the Glasgow Herald. Having been treated to one busker on his first train, he was bewildered to find that on his second train yet another busker, equipped with a ‘stringed instrument’ , bundled himself into the passenger compartment. In the compartment were not only our passenger, but three men and a woman, all of whom were in funerary dress and in some distress, having just come from an internment. Not content to add to the troubles of the recently bereaved through his performance, the busker then managed to get into an argument with the occupants of the next compartment, a group of half-drunken sailors, the resulting ‘roaring, stamping, and stumbling’ of which lasted over an hour. An Observer demanded that something should be done about these “musicians”, but it is clear that the busker was becoming an increasing presence on the railways, and especially in suburban London. One busker in particular was apparently something of a presence in East London. In 1894 Mr Phillip Rigluth was called up in front of West Ham magistrates. According to a railway inspector, Rigluth was in the habit of taking a two-pence ticket and then travelling for hours around the Great Eastern Railway playing a concertina. In fact his concertina playing wasn’t what had landed him in court, rather he’d tried to get onto another train for which his ticket wasn’t valid, been caught by an inspector, and found himself fined 40 shillings by the magistrate for the pleasure. But the fine didn’t put Rigluth off, far from it. In 1898 Dr F Greenwood was travelling home from Liverpool Street to Leyton on an evening train. At Globe Road station a busker jumped into the carriage and started playing a concertina. Greenwood demanded the man stop, but the busker was encouraged by some passengers of ‘the rougher sort’ to play as hard as he could. At the next station Greenwood managed to get hold of a guard, who ordered the busker to stop playing. Unfortunately for Greenwood as soon as the train left the station the busker started up again, as ‘the roughs encouraged him with words and coppers’. At Stratford Greenwood tried to get out to make a complaint, but was forcibly restrained by the other passengers as the busker fled the carriage. The busker’s escape was, however, short lived, as he was known to the railway company. It was, of course, Phillip Rigluth, who found himself back in West Ham Magistrates Court and this time was fined 14 shillings, or a ten day prison sentence if he defaulted. Even this, however, did not dent our erstwhile busker’s enthusiasm. In 1900 he was caught again trying to get onto a train without a ticket, armed with his trusty concertina. Back in West Ham Magistrate’s Court for apparently the fourth time, Rigluth found himself fined 100 shillings (to put this in context, the average wage for a labourer at this time was around 20 – 25 shillings a week), the maximum penalty possible, with the threat of a month’s imprisonment if he defaulted. Why was Rigluth so keen on busking? The information on him is scanty, but provides something of an explanation. Rigluth was an elderly man. He also claimed to be crippled. The combination of the two, he argued, meant that he was unable to work, so instead he eked out a living busking on the trains. Given he did so for at least six years, it seems a likely explanation, though slightly at odds with the account of his fleeing from the good Doctor two years previously. He was certainly a far cry from the ‘young people’ An Observer was so aggrieved by in 1869. Whilst buskers were frequently complained about, from the concertina players to the ‘second rate vocalist’, they were a presence on the railways that was here to stay. They were typically male and usually found in the third class section of the trains. Indeed, An Observer remarked that such a commotion would never be allowed in first class, and Lloyds Weekly wryly commented that among some long-suffering passengers was the suspicion that certain of the railway companies permitted the nuisance in order to drive them into paying more to travel in the busker-free second and first class carriages. Certainly, there are references to the lower railway officials (porters and guards) doing little to prohibit busking, and only when the busker could be prosecuted for travelling without a ticket did the railway companies take effectual action. Rumours of railway company conspiracy aside, the itinerant musician had become part of the social fabric of the railways, and they remain annoying and entertaining people as much in the 2010’s as they did in the 1860’s. He demanded these items be prohibited. This letter is fascinating in certain respects. Firstly, it is one of those rare examples of an article that manages to conflate mammoths, a large prehistoric mammal, with handbags, which are neither prehistoric or mammals. Secondly, it underlines how certain groups on the London Underground have often been picked on by the rest. “The rest” have usually been the male middle-class commuters. In my own Ph.D. work they (or the management on their behalf) usually pick on the male working-class passengers (who are invariably presented as a smoking, spitting, dirty, drunken hoard of menace bringing horror to everyday travel). But a quick look through the newspapers of yesteryear revealed another target; ladies. I use the term ladies specifically. “Women” was a term typically applied to third-class working-class passengers (who were also referred to as work-women like their male counterparts were workmen). “Ladies”, however, usually referred to middle or upper-class individuals who travelled second and first-class. Complaints about working-class female passengers seem rather muted (in comparison to working-class men and middle-class women), but perhaps this is because they rarely shared the second and first class carriages with the male middle-class commuters so keen on writing off to The Times. The initial problem seems to have emerged from the complicated system in force on Metropolitan trains from the 1860s. Not only were trains divided into three classes, but there was the added complication that certain carriages were smoking and non-smoking and briefly in 1874 – 5 some carriages were ‘Ladies only’. The ‘Ladies only’ carriages unsurprisingly provoked waves of outrage. Typically they were empty, which during the rush hours raised the ire of many a male commuter trying to force his way into an overcrowded carriage. But perhaps more irritating for the lone commuting male was the idea that a lady could take a man onto the carriage ‘under her protection’, permitting husbands to travel with wives. The perceived double standard fed the anger, with one gentleman writing angrily that the ‘protection’ system was ridiculous and that lone married men and clergymen should be allowed on the carriages as well (presumably because they theoretically presented none of the dangers of single men). The ‘Ladies only’ restrictions soon disappeared. In 1891 the periodical Moonshine published a short piece entitled ‘what you ought to do (if a lady on the Underground) – by one who knows’. It presents the lady passenger as utterly incompetent, beginning with ‘on presenting yourself at the booking office, be careful to reach the window from the wrong direction, and be the more careful to do this at stations where directions are painted up largely and plainly’. But the article, not a particularly inspired attempt at humour, reveals the main point of contention between male and female passengers – smoking. Smoking had been banned by the Metropolitan Railway when it had opened in 1863. But, despite the numerous complaints about the sulphurous atmosphere the steam worked railway generated (indeed, to the extent the smoky atmosphere was killing people), the smoking lobby became increasingly vociferous about passengers being allowed to smoke on the system. By 1874 the Metropolitan and the slightly younger District Railway acceded to the demands (and legal obligation) and provided separate smoking carriages. Smoking carriages were effectively a male space, ultimately because smoking was an activity largely restricted in public to men. This is perhaps why in the early 1920s the idea of the female ‘flapper’, a woman who showed apparent disdain at established social conventions, was often linked to the individual to being a public smoker, as this little 1922 cartoon depicts (along with what was clearly on the minds of certain repressed gentlemen). Moreover, the carriages on the Metropolitan and District were compartmentalised (divided into sections), which meant passengers were sat in close and confined company with each other. It was seemingly felt that if a lady was present in the compartment then the men were usually obliged to stop smoking. Notably it was the First Class carriages which were the main setting of these complaints, reinforcing the idea that it was middle and upper-class men taking issue with women of the same social class. The smoking issue appears to have been less of a problem on the tube railways, where carriages were open (you can walk up and down the whole carriage) and there were no class divisions. But on the Tubes there was apparently a bigger problem that women were bringing into the Underground; hat pins. The incident was hardly isolated. Three weeks earlier a lady had been fined £3 through the Law Courts for inadvertently scratching another lady in the face with a hat pin. ‘One for all’ painted a scene of daily terror for passengers on the tube as hat pins waved maliciously about threatening to ‘give you a little souvenir’, and pointed out that on the London County Council’s tramways such was the perceived danger that signs were put up inside tramcars urging ladies to wear protected hat pins. Notably the complaints regarding female passengers sent into the papers almost disappeared after the Great War. On my own brief survey of the newspapers, the only complaint subsequent to the 1914 hat pins is the 1960s ‘Mammoths of the tube’, which appears more the rant of one particular male suburbanite than a widespread issue. Perhaps the ebbing away of the complaints was largely due to women becoming an increasingly large presence on the Underground during and after the Great War, as the trailer for the 1928 film Underground suggests. Women had been a minority on the Underground before the Great War; their presence was new and provoked comment because it was new. 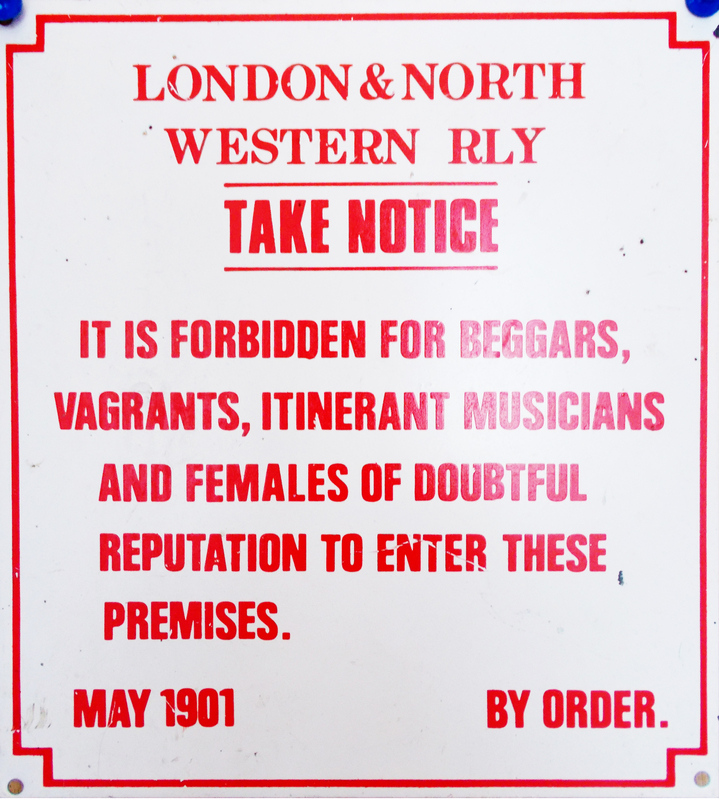 A similar issue arose with male working-class commuters, a group who also were complained about bitterly before 1914 when their travelling was something of a novelty. But both groups rarely gained such overt criticism after 1918, when complaints usually focused on the fact that everyone, women, men, working class, and middle class were all being squashed together during the rush hour. Perhaps they also found someone else to pick on. For the regular Underground users of today (of all sexes, classes, and races) it’s often the utterly perplexed American tourist stuck at the ticket barrier gazing deeply into their Oyster card as if the card itself will suddenly perk up and inform the holder how it all works. Clearly a problem so bad they had to make this bewildering advice video. Why we should renationalise the railways. *This post was originally published in 2013, before East Coast was pointlessly privatised. So recently I had the dubious pleasure of reading an article on the BBC which presented two points of view on whether or not to nationalise the railways. Now I’ll admit I’m something of a leftie, so I was always going to come down on the side of the nationalisation chap, but my massive initial bias aside, what really irritated me about the privatisation argument was something that never fails to get on my nerves. Bad statistics and appalling reasoning. For anyone familiar with South Park this is well demonstrated in the episode “Medicinal Fried Chicken”. Essentially, for the uninitiated, South Park closes their KFC and replaces it with a medicinal marijuana clinic. In order to get a doctors referral for this marijuana the menfolk of South Park decide to give themselves testicular cancer. At the end of the episode, the local doctor argues that KFC had massive health benefits because since its closure the cancer rate has gone through the roof. Now, anyone can see this reasoning is ridiculous, as it completely fails to take into account the underlying links between factors. This is something the railway privatisation argument does in spades, and, to add insult to injury, without the catchy Hoppity Hop tune they played in South Park. So what am I complaining about? Well let’s take the privatisation chap’s key (and only) argument; passenger numbers increased when private companies ran the railways. Hence privatisation is brilliant. What we’re clearly going to need to is a nice graph; which is here thanks to wikimedia commons. The graph shows the number of passengers travelling by rail from 1830 to 2010. In the period before 1923 the railways were run by private companies, though between 1914 and 1921 the vast majority of railways were under government control. The increase in passenger numbers before 1923 was undoubtedly incredible. But was this down to the fact the railways were private companies? Probably not. Until the start of the twentieth century the railways were the unrivalled means of transport in Great Britain. Contemporary long-distance alternatives were effectively only horse drawn stage coaches (slow and expensive), the canals (not known for their passenger services), or coastal shipping (a tad useless inland). None of these were really able to compete. The railways, promoting suburbanisation and offering cheap fares to a population with rising incomes, were effectively bound to pick up the traffic because they were generating it. The only rivals to the railways that really emerged were electric trams and motor buses, and these only made inroads after 1900 and really only affected short distance travel. Perhaps the real lesson of this period was how competition damaged the railway companies. The London Chatham and Dover and the South Eastern Railway slugged it out in the south of England for some 40 years. The result wasn’t two lean competitive railways, but two companies on the verge of bankruptcy with notorious services. Railways had been pointlessly duplicated which cannibalised the traffic and hit revenues. In 1899 the two companies threw in the towel and merged into the South Eastern and Chatham Railway, monopolising the railways in Kent. Competition it seemed was more the disease than the cure. In 1921 it was decided to “group” the railways into the so-called Big Four; the Southern, London & North Eastern, London Midland and Scottish, and Great Western. The reason for this our erstwhile privatisation chap claims was to protect profits. Well, not quite. The Act which introduced the grouping actually states the intention was ‘…the reorganisation and more efficient and economical working of the railway system of Great Britain…’ Total nationalisation was potentially on the cards as well, but seen as going too far. By 1948, however, Labour was in power, the Second World War had badly damaged the railway infrastructure, and nationalisation was seen as the only cure. On 1st July 1948 British Railways arrived on the scene. Until 1955 it was all going rather well, but in that year the railways recorded their first operating loss. The losses failed to stop thereafter. Passenger numbers also started to plummet. Was this the result of “state bungling” as our privatisation chap would have it? Well, perhaps it had more to do with the railways new nemesis, the car. Car ownership jumped by 250% between 1951 and 1961, increasingly drawing people off the railways. Certainly there was bungling on British Railway’s part, the modernisation plan of 1955 introduced a host of unreliable diesel locomotives, but ultimately the real issues were a capable long distance competitor and rising costs in labour and infrastructure. Attempts to solve the issue produced the notorious Beeching Report in 1963 which saw just under a third of Britain’s railways closed. Even this didn’t stem the losses, and by 1968 the idea of subsidising the railways to protect their social benefits emerged. It’s difficult to see how private companies would have fared any better. Under the current system railway companies (or rather “Train Operating Companies”) don’t pay out for the majority of infrastructure, this is undertaken by Network Rail, relieving them of a large portion of the crippling costs British Railways faced. In fact the debt Network Rail accumulates is now estimated to hit £50 billion by 2020. But wait, in the 1980s passenger numbers started to pick up. Privatisation chap didn’t mention that. You see British Rail (as it was now called) wasn’t utterly incompetent. In 1976 the Intercity 125 arrived, increasing speed and comfort on long distance routes. Though perhaps the tagline “we’re getting there” summed the situation up a tad cuttingly. Passenger numbers took a dive in 1987, but that can probably be explained by this. I totally advocate watching the first two minutes worth of this, firstly because you realise just how similar the news is 25 years later, secondly, Nigel Lawson never looked so amusing, and thirdly, it makes me appreciate Chris Morris’s brilliant news satire The Day Today all the more. Passenger numbers recovered, but British Rail wasn’t around to see it, privatisation set in in 1994. Did privatisation really boost passenger numbers? The link is pretty dubious. Countless other factors were in play and to suggest such a simple relationship is pretty foolhardy. The latest jump in passenger numbers is probably accounted for in the rising costs of owning a car and the growth of London (which has the lion’s share of railway journeys). Even with fares rising over the rate of inflation, it’s still easier to take a train into the city than a car. I seriously doubt anyone would put themselves through travelling on the railways in rush hour if it was cheaper and easier to drive. What privatisation did do, however, was rapidly increase government subsidies to the railways. So much for saving the taxpayer money. Furthermore many of the private operators are owned by foreign state run railway systems, such as the German Deutsch Bahn or France’s SNCF. Ultimately the money spent on the railways here winds up subsidising these railway systems abroad. This fits well with the current government’s two key policies of pointlessly spending as much taxpayer’s money as possible and giving money to Europe. So is there a case for nationalisation today? Definitely. In fact parts of the system are already nationalised. East Coast is owned by the state and in 2011-12 paid back to the Government around £187 million, the second highest total (not bad considering the last private operator of the line went bust). If one also takes into account the spending by Network Rail on maintaining the railway itself, then East Coast actually comes out as the best value for money. But perhaps rushing off to bring back British Rail isn’t quite what’s needed. The current franchise system fails completely in this regard. Instead one should look at the renaissance that Transport for London (TFL) is currently unleashing. I do not refer to London Underground (though that’s operating better than ever) but its little brother, London Overground. The Overground is something of a half-way house between nationalised and franchised. TFL are in overall control, but a private company runs the day-to-day services under a concession agreement. They do it pretty well to, with an exceptional service and increasing passenger numbers. Anyone who travelled on the North London line, for example, before the Overground took it over will know exactly what I mean. Whenever I have a conversation with someone who had to travel on Silverlink Metro their eyes glaze over as they flashback to the unending horror and a solitary tear rolls down their cheek. The success of the Overground largely lies in the fact it’s operated by a public concern that seeks to benefit the public at large (the Overground extensions have vastly improved the means for travelling around London), has a consistent plan on how to deliver this, and does it at a reasonable price. In fact they’re now planning to take over the line to Enfield where I live. That can’t happen fast enough. I’m fed up of triumphantly getting a seat of the train (having elbowed every other man, woman and child out of the way) only to have it fall off and pitch me to the floor. As such I’d suggest that if nationalisation is to be done, let it be done on the lines of the London Overground. Let private companies in if necessary, but keep them under a strong leash. We don’t need a re-run of the original British Railways, but a series of publicly owned concerns tied in with their local areas or focused on inter-city travel, with a regulator on top to make sure it’s all connected in some fashion. That, or everyone should get an autogyro. *All the sources I’ve used are given as links below. Yes, I’ve left stuff out. What about the LPTB some may cry, or Sectorisation, or freight?! Well frankly this blog post is long enough. Heck I doubt even a couple of people will make it this far. If you did and are outraged, do feel free to accost me on twitter. If you want a deeper analysis of the situation this report is probably best. Ten years ago a revelation appeared in London. To some it was part of the relentless march of technology. To others it was convenience epitomised. The Oyster card had arrived. Since its introduction it’s undoubtedly made life, on the whole, much easier not to mention more fun, especially when you melt them down in nail varnish and stick the chip into something else . It also removed one of the biggest problems with using buses, the need to proffer the exact fare in cash, a problem that has afflicted even the greatest among us. I remember the olden days, when my fare in London was 40p in coins and Noel Edmonds was a beloved television personality. But soon the fares went up, coins and Noel Edmonds fell out of favour, and the world moved on. For the Victorian inhabitants of London paying for a bus was a more complicated business. Not only was there the need to get your change right, but there was the ominous problem of ‘pirate buses’, which stemmed from the fact that practically anyone was able to buy and operate their own bus. This led to a large number of competing concerns, some commanding a huge number of buses, as the London General Omnibus Company (General) did (controlling in 1856 some 600 of London’s 810 buses), whilst other operators could simply be two guys, a driver and conductor, and one bus. The General chose to standardise its buses, charging low fares, but the other operators could charge what they liked so long as there was a sign in the bus showing what the fares were. In practice, however, the sign was often hidden away out of obvious view. Furthermore, several more canny operators painted their buses to look like the General’s did. As such, unwitting passengers wound up boarding these buses, proffered the usual low fare, found the conductor demanding twice that amount or more, and were forced to pay it because legally they had already started their journey and by legging it they could be charged with fare dodging. Unsurprisingly the operators of such buses were soon referred to as ‘pirates’. Usually the passenger was obliged to grin and bear it, but at least one man got his own back on the pirates, Mr William Saunders. In 1892 Saunders had jumped onto a bus and to his horror found himself charged double the usual fare; he’d accidentally boarded a pirate. To add insult to injury the bus then made half speed and ‘stopped wherever an apology for doing so could be found’. Saunders, reflecting on his misfortune, decided therefore to warn other people off, and whenever anyone else tried to get on board he shouted at them that it was a pirate bus. At this the conductor got increasingly irate, demanded that Saunders leave the bus, and when Saunders told him he wasn’t going anywhere, the conductor called for a police constable to remove him for ‘interfering’. Saunders was in fact the Liberal Member of Parliament for Walworth. Alas for Londoners pirate buses lasted well into the 1920s until they were effectively made illegal. But the incident not only proved a good example of the power of passive resistance but furnished us with a delightful account of one man versus a torrid injustice. As the Bristol Mercury wryly titled the article on the matter; ‘An MP in the Pirate Bus; the biter bitten’. So recently I watched a film on my Dad’s recommendation. Now ordinarily I’d have approached this with extreme caution, but he very quickly managed to sell it to me. It had Denzel Washington in it he said. It had trains in it he said. What the hell is it called I said. He didn’t remember. Anyway, a quick search for trains and Denzel Washington later and I find myself watching the film “Unstoppable”, about a runaway train. It’s a worthwhile film to watch if you want to see Denzel Washington, trains, and several huge explosions. I mean, seriously, what more could you want? The film itself is based on a real event known as the CSX 8888 incident, which is much like the film except with fewer explosions and less Denzel Washington. This reminded me of an accident I read about in a Victorian newspaper, a story more thrilling and tragic than ‘Unstoppable’ which I outline for you below. Sadly Denzel Washington doesn’t feature. Bradford, Saturday 12th 1885. Driver John Umpleby is ordered to get up steam on Engine Number 5, a steam tram (what the devil is this steam tram of which you tell, you might be thinking, well here’s a video of one). Engine No 5 had been under repair. In the process of these repairs the braking and reversing gears had both been uncoupled. Much to Umpleby’s surprise, the engine suddenly started moving forward, left the tram depot, and then rattled at speed onto Manchester Road, which happens to be a steep downhill slope. Umpleby remained on board and managed to reconnect the reverse lever. He threw the engine into full reverse, but the only effect was to slightly slow the 10 tons of suddenly liberated tramcar. Engine No 5 was now completely out of control. It was also about to turn into a killer. In the vicinity of Dewhurst’s Mill the runaway engine came upon a horse and trap being driven by Jacob Wilkinson and Samuel Banks. Clearly there was no warning. No 5 smashed through the trap and killed the horse. Portions of the trap were scattered a radius of 40 feet around the collision. Wilkinson was killed immediately, his body literally ripped to shreds. Banks was flung onto the engine’s boiler, whereupon he was then badly scalded. Umpleby was still trying to stop the engine, which he managed to bring successfully to a halt on Jacob Street. Banks was taken away alive, but died later of his injuries. Umpleby, suffering so badly from shock that he was physically paralysed, had to be helped off the vehicle. This should have been the end of the matter, but Engine No 5 had other ideas. With both men having been removed, the tram, because of the steep gradient, had started to move again. Henry Culler, an employee with the tramway company, saw what was happening and tried to board No 5. But the engine was moving too quickly. He lost his footing and was dragged along the line before finally getting himself free. The engine was now coasting down the hill at 20mph towards town. Across No 5’s path this time was a horse and cart belonging to a mineral water manufacturer. The driver, luckily, saw the oncoming menace and jumped clear. His horse, however, was considerably less nimble and became the latest victim of No 5’s rampage. The engine then continued on with its course, narrowly avoiding two tramcars packed with passengers and several other vehicles along Manor Road. Happily for everyone No 5’s careering was about to come to an abrupt end. Coming onto Market Street the engine failed to negotiate a sharp curve, left the rails, and finally came to a rest at the base of a large statue of Sir Titus Salt, noted manufacturer, philanthropist, and politician. Rush hour, gardening, and women. It should be noted that before the Great War the definition of overcrowding was usually the mere fact that people were standing up. The Metropolitan Police had banned passengers from standing on buses and trams before the war on the grounds it was unsafe. Such regulations were soon thrown to the wind given the crush. Though the term had been used before, it was only now that it took on its true meaning, the “rush hour” had arrived. Rush hour was mainly caused by the introduction of the 8 hour working day. Before the War the working classes typically travelled in earlier and out later from work than the middle class. This staggering of working hours had avoided problematic crushes, but the 8 hour day aligned working hours far closer together. With everyone travelling at the same time the result was a logistical nightmare that has baffled transport experts ever since. At the time, however, there were some more outlandish ideas behind the problem. For the Great Eastern railway part of the problem was obvious; allotments. In 1916 Britain had adopted British Summer Time (where all the clocks go forward by an hour). This, the Great Eastern claimed, had led to brighter evenings which in turn had encouraged the working classes to start gardening. Others had taken up sport. The result was that come home time, instead of loitering around the city, every working man in London was racing home to put up some decking via the nearest Homebase. This, the Great Eastern claimed, “be it much or little” was clearly part of the reason for the evening rush hour. Every tube train it seemed was being overwhelmed by hoards of apathetic women forming an almost impenetrable barrier to the other passengers, a consequence of the women’s “unfamiliarity” with the system. Thankfully both of these reasons don’t appear to have been used since in explanations for the rush hour. But aside from the amusement value these excuses have to us today they outline some of the most important points in Britain’s social history. The compression of working hours, which had created the rush hour, played a major role over the next few decades in breaking down class barriers. The fact that women passengers were being used as an excuse showed that they were becoming a visible presence as commuters for the first time on the railways. Even the Great Eastern’s claim about gardens demonstrates a noted increase in the leisure time available to the working class, something few had the time or money to afford before the War. It’s a fact of human nature that we tend to be creatures of habit, and it’s the things we do almost unconsciously that are the most ingrained. For example, you want to call a lift, well you just hit the button. You get in, hit another button, arrive at your floor, and carry on merrily with your journey. You’ll hardly think about what you’re doing, because, having done it so often, it’s practically second nature. If you called the lift, the doors opened, and six dozen purring kittens poured out onto you it would freak you out a bit. It would be awesome, but a bit weird. All because you weren’t expecting it to happen. This is why pranks like this are so amusing (my favourite is the one where the innocent member of the public that thinks they’ve allowed a blind man to plummet to his death down the lift shaft, it’s a tad morally dubious, but jolly good fun). It was ingrained habits like this which got Englishman George Manners, a clerk from Bayswater in London, into such trouble whilst visiting Dublin in 1899. In London today, if you hop on one of the old Routemasters (route 9 still runs them), you’ll find that you ring the bell by pulling twice on a cord that runs along the ceiling (rather than pressing a button). This gives the signal for the driver to stop. The same system was in use on the trams that used to run in London as well. This was the system that our man George had clearly gotten so used to that it was second nature to him. Travelling down Amiens Road in Dublin, George decided he wanted to get off, so he ambled down to the end of the tram, looked for the cord, and promptly pulled twice on it. Unfortunately for everyone involved, the cord George had pulled didn’t have anything to do with the bell. It was actually a rope tied to the trolley pole, which is the pole which connects the tram to the overhead power cables, as you can see here. The trolley pole promptly broke loose, spun round violently, smashed the power cables, from which, the local paper reported, “electric flame gushed forth”, and was sprayed onto the hapless passengers sitting on the open-air top deck and one poor bloke who was walking past on the road. Three men had to be taken to hospital, one of whom complained that for hours afterward he felt like he was “on fire”. Luckily, aside from a two suffering temporary amnesia, they were all relatively ok. Or as ok as you can be having been violently electrocuted. In the meantime the power cables had gotten so tangled that a group of engineers had to be dispatched to try and fix the problem. In a move that would bewilder the modern health and safety executive, nobody actually bothered turning off the electric current as they tried to fix it. Instead, the workmen were “armed with insulating gloves”. However, as the workmen tried to repair the damage the newspaper reported “the wires emitted long tongues of flame accompanied by startling explosions”. But the workmen were obviously fine, because they were wearing gloves (which presumably repelled the explosions). At some point someone did decided to cut off the electricity supply, but also managed to knock out the electrical supply to all the trams in the immediate area which were then stranded for three hours until the cables were finally repaired. Having typed in “buses are boring” into Youtube just now I was dismayed to find at least four videos where people complain that buses are boring. I didn’t actually bother watching them, and admittedly I only searched for them so I could come up with an introduction to this post, but it raises an important point. Buses are boring. But you should be thankful that they are. In the late nineteenth and early twentieth centuries buses were far more exciting. In fact, they were too exciting. With a myriad of different companies competing for passengers, things occasionally got heated. Buses would often try daring overtaking manoeuvres in order to get to a bus stop first and claim the bounty of passengers. Unfortunately, this tended to encourage the bus being overtaken to up its speed and fend off the challenge, the result was occasionally carnage. In 1884, a bus operated by the London General Omnibus Company tried to overtake a competitor at speed. One passenger took issue with this, and demanded the driver slow down. The driver reportedly told the passenger to “mind your own business”. At this point the bus smashed into a bus shelter, promptly did a barrel roll, and sent the passengers sat on the open top deck flying off into the road. Five years later The Times reported that because of several days of racing, ‘a woman was killed, a cab was smashed, a boy was knocked down, and a bicycle was run over by omnibuses in the King’s Road’. Whilst the death of a woman and the maiming of a child was an accepted part of Victorian society, the destruction of an innocent bicycle was clearly shocking enough to be reported. Even as late as 1910 racing still occurred. Two racing motor buses ploughed into each other in Chelsea, sending one bounding across the pavement before it obliterated the front of a pair of shops and sent a shower of glass over the hapless spectators. The result of all this was that Victorian and Edwardian London sometimes resembled the scene from Star Wars Episode IV were Porkins loses control of his X-Wing and ploughs into the Death Star. Except with buses. And fewer lasers. All in all, the next time you’re stuck on a bus perhaps you should be more thankful. Like these people.